Buy the US Blu-ray with both versions. What started with Pitch Black in 2000, went on to become a franchise that centers on the character of Riddick, embodied by Vin Diesel. The first film was a dark survival thriller that hinted that there's more to that muscular criminal with the night vision eyes. And this mysterious importance had potential in the minds of the studio execs, who granted a budget of $105 million for The Chronicles of Riddick, an attempt to illustrate said background story. For this, a totally different story path was chosen and a change of style was designed, elevating the character into a mystic epic with many fantasy elements and political intrigues within the ranks of the mighty Necromonger race. However, this project didn't really resonate with most viewers or critics and barely made back its budget ($115 worldwide box office). No surprise that years went by without a new film with the character being on the horizon. It took Vin Diesel's personal initiative that a third movie has come to life. This one is simply called Riddick and goes back to the roots. After Riddick became the new leader of the Necromongers, his life hasn't become that much better and he just wants back to his home planet Furya. However, he gets betrayed and is left alone on a deserted planet that offers a lot of danger from the wildlife (as we see in the first 20 minutes of the movie, almost without dialogue, which is easily the most impressive sequence of the entire film). As mercenaries want a piece of him once again, he has previous experiences on his side - an advantage that his unplanned companions do not have. As we see, the recipe strongly resembles the one from Pitch Black but has better effects and grabs the viewer's attention because he has a way better idea of who Riddick is. Independently financed, the small budget of just $38 million could already be made back in US cinemas and went on to almost hit the $100 million mark worldwide. Still no outright hit but possibly an argument for Diesel if he should ever plan to convince a studio of the necessity to do a 4th film. Director David Twohy hinted prior to the theatrical release date that the home video releases could contain a longer version of the survival thriller. It was supposed to contain more of the mythology in the background. The movie's first cut clocked in at 2 hours 20 minutes, a runtime that is unsuitable for most of today's cinema films. Twohy shortened it until it reached the desired 2 hour-mark but promised to enrich the Unrated Extended Cut with some of that material. And that's what he did. 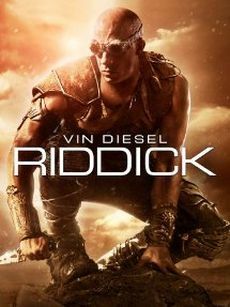 While the theatrical version is quite short on the matter that Riddick left the Necromonger throne, the Extended Cut shows that for him staying on wasn't really a life-prolonging option. And the ending was also notably prepared for the theoretical possibility that a 4th film could transport the story in Chronicles of Riddick directions once again. It remains to be seen if that ever happens but in the meantime, fans of Riddick can raise their hopes a little more with the Extended Cut of the film that makes another adventure of their hero more plausible. For those viewers that "just watch" the film, the longer version does make the film somewhat more structured and round. If you want to purchase the Extended Cut of the film, make sure to grab the Blu-ray since the DVD only contains the theatrical cut. Comparison between the Theatrical Cut (R-Rated) and the Unrated Extended Cut (both included on the German Blu-ray by Universum Film). The Extended Cut runs 488.8 sec. or approx. 8 minutes 9 seconds longer than the Theatrical Cut. 0:11:12: The UR has a minor extension in Riddick's monologue. TC: " It's always the punch you don't see coming that puts you down. But why didn't I see it? Of course they were gonna try to kill me. Death is what they do for a living. So the question ain't "what happened". The question is "what happened to me"?" UR: "It's always the punch you don't see coming that puts you down. But why didn't I see it? Why didn't I see it? Of course they were gonna try to kill me. Death is what they do for a living. So the question ain't "what happened". The question is "what happened to me"?" 0:12:34: Vaako can be seen in the ceremonial hall and Riddick says: "Okay, more nooses than crowns.". Then we see him standing at a panel while Vaako observes him from a different corner of the room. Riddick's off-commentary: "I needed a way out. Some new place. Or maybe just an old one. But how do you find something that you've never seen?" After that, both scenes in Riddick's private quarters differ severely. Theatrical Cut: While the naked women lie on the bed, Riddick sits on his throne and drinks. In the off-commentary, he says that he couldn't really agree with the oath that every Lord Marshall has to swear which led to several assassination attempts. Then Vaako enters and we see Riddick standing at the window. We now hear that Riddick thinks about going to another planet. The talk between him and Vaako and how he wants to go to Furya is much shorter but has the same essence. Vaako knows the way to Furya but wants Riddicks crown in exchange for it. As that is settled, the scene on the deserted planet begins. UR: Once again the naked women on the bed but no off-commentary by Riddick. He sits on his throne and one of his concubines approaches him. She says she is under the impression that he never sleeps and he replies that it's hard to sleep when there's so much distraction (shot of naked women on the bed). She asks him what the way to a man's heart is. According to Riddick, that would be between the 4th and 5th rib, at least that's the way he goes every time and just to make sure, he twists the knife afterwards. She tells him that the assassins are after his head because he isn't a believer and that they would never allow that he leads them into the underverse. They think that something is wrong with him, that he's a cursed, unholy man. Riddick asks dryly what he's supposed to do when he was born this way. After that, the concubine asks whether the guards are still in front of the door and Riddick checks it out. As he looks through the door, the woman gets a knife and runs towards Riddick. Another woman screams to warn him but it's too late, the blade penetrates Riddick's upper body. He turns around calmly, as if nothing happened, holds the woman and says that she was supposed to stab him between the 4th and 5th rib because the position she stabbed him (between the 5th and 6th rib) is just empty space. Then he stabs her (nothing graphic to see here). He then sits on his throne again and eats a fruit as Vaako enters the room. The dead woman lies on the floor and Vaako says that it appears that Riddick made further friends. The new assassination attempt could only come from the Commander and Riddick doesn't doubt that one second. He throws the knife to Vaako's feet and leaves his throne which is soaked in his blood. He goes to the window and says that Vaako lost his nerves when it came to claiming the throne and asks what he plans to do to finally get it. Vaako replies that he envisioned something different and throws the dagger back to Riddick. Vaako tells as story about the first invasion he was a part of. He was still a child and they attacked from the sky, because that's what Necromongers do. An epic destruction but still there was resistance. Each of those enemies killed 100 Necromongers with his weapon and after the ammunition was gone, they killed 30 more with their bare hands. If they had that firepower and manpower still today, they would beat the Necromongers. And Vaako sees the last of these great warriors right in front of him because he couldn't forget his eyes. Riddick looks just like them. The planet the fight took place on was Furya. Now, different camera angles are used in the dialogue between Riddick and Vaako while the content of their talk is basically the same. Furya in exchange for the crown. After that, an exclusive scene follows that shows the Necromonger fleet. A shuttle flies off and Riddick is in it. In a voice-over, Riddick is vocal about his relief that he can finally leave all that behind. Then, the scene on the planet begins. 0:23:56: The pack of wild dogs isn't too happy that Riddick stole one of their young ones. They stand in front of his cave and howl from a distance. However, Riddick has a useful tool at his disposal. He positions a scarecrow in front of his cave and that looks just like one of those water creatures that killed one of the dogs shortly before. The howling stops immediately. 0:24:54: Before Riddick throws the bait into the water, we see how he tries to get their attention in the UR. He bashes a bone on the rock he's sitting on and creates a lot of noise. The theatrical cut just fades over directly to the shot in which he observes the water and then throws the bait in. 2:00:12: The UR contains a final scene that is completely new and takes place on the Necromonger ship. Krone, who left Riddick on the planet, kneels before the window and prays to the underverse. The Necromonger fleet gravitates towards it. Riddick appears and threatens Krone with a knife. He wants to know where Vaako is. The answer that Vaako is dead doesn't really satisfy him, though. Krone further tells him that Vaako did indeed plan to bring him to Furya but that Krone interfered with that plan and decided to leave Riddick on that other planet. Krone goes on to talk chaotically about how Riddick isn't fit to lead them but Riddick stops that charade by stabbing Krone in the neck. Now that Krone is dead, Riddick goes to a slave and wants to know the answer from her. Is Vaako alive or not? "Both" is the reply he gets. Sounds like Vaako is in the underverse and this is a preparation for a possible 4th film. Riddick looks a little puzzled and goes to the window, staring at the underverse in front of him. In the background, we hear how Vaako says "transcendence".